This page was set up by Robert Sewell in July 2006 to show the descent of the Sewell Family from the Robertian and Capetian Kings of France. Robert Sewell graduated from McMaster University (Hamilton, Ontario, Canada) in 1967 with a B.Sc. degree in chemistry. After a year of studies at the University of Toronto's College of Education, he taught high school science in Collingwood, Ontario for a year and then taught chemistry, physics and general science in Hamilton, Ontario for twenty-nine years. Robert Sewell retired from teaching in June 1998. George Andrews Moriarty: The Plantagenet Ancestry of King Edward III and Queen Philippa, Mormon Pioneer Genealogical Society, Salt Lake City, Utah, 1985. For most of the middle ages, the land we know to-day as France was neither a distinct political nor geographical place. The territorial boundaries rarely coincided with modern France. Originally part of the Roman Empire, the region was settled by Germanic tribes from central Europe including the Franks, Visigoths and Burgundians. At the end of the fifth century, Clovis united many tribes into a single Frankish kingdom. Following Clovis' death in 511, the kingdom was split up among his four sons according to ancient Frankish tradition and law. Charlemagne (742 - 814) founded a Frankish empire covering what is to-day France and Germany; but it too was split up after the death of his son Louis (I) "the Pious" in 840. The election of Hugh Capet as king in 987 began the Capetian Dynasty which ruled France for much of the middle ages. However, the actual royal domaine, known as Ile-de-France, was small and weak, consisting of little more that the land surrounding Paris, Orléans and Laon. It was not until the 12th century that later Capetians took steps to strenghten the king in the Ile-de-France. Frederick L. Weis and Walter L. Sheppard: Ancestral Roots of Certain American Colonists Who Came to America before 1700, 7th Edition, Baltimore, 1999.
who was a Count in the Upper Rhine and the Wormsgau 770 - 807 and Lord of Dienheim in 795.
who was Count of Worms 812 - 830. Born in 866 after the death of his father. Liegarde (or Hildebrante) who married Herbert (II), Count of Vermandois. Robert married secondly about 895 to Beatrice de Vermandois, daughter of Hubert (I), Count of Senlis and Vermandois and a descendant of Charlemagne. Please click Charlemagne for details. Emma of Paris (d. 962) who married in 960 to Richard (I) "the Fearless" 3rd Duke of Normandy. Note: Weis states that: "Richard I 'the Fearless' . . . m. (2) 960 Emma . . . dau. Hugh Capet (see 53-20)" The reference (53-20) is for Hugh Capet (941 - 996), the First Capatian King of France and a son of Hugh "the Great". Clearly, Emma could not be a daughter of Hugh Capet (941 - 996) when she married in 960; Weis is mistaken and the reference should be (53-19) which is Hugh "the Great". See Frederick Lewis Weis, Ancestral Roots, Baltimore, 1999, 121E-20 and 53-20. Hugh Capet married third circa 938 to Hedwig, a daughter of Henry "the Fowler", Duke of Saxony, King of Germany and Lorraine and his wife St. Matilda (or Mechtilde) of Ringleheim. Note: The third marriage is shown in the 1985 photographic reproduction of George Andrews Moriarty's The Plantagenet Ancestry of King Edward III and Queen Phillipa pages 24 and 25 and in Frederick Lewis Weis, Ancestral Roots, Baltimore, 1999, 53-19. Beatrice, born circa 939 who married in 954 to Frederick, Duke of Upper Lorraine. Robert (II) Capet "the Pious", King of France, mentioned next. Adelaide (also Adeliza and Alice) de Clermont who married Gilbert Fitz Richard de Clare, Earl of Clare. Robert married first about 987 to Rosela (or Susanna), widow of Arnold, Count of Flanders who died on March 30, 987. This marriage was repudiated in 992. Robert married second in 996 to Bertha of Burgundy who was a distant relative. This marriage was repudiated in 998. Hugh Capet born in 1007 and died before his father in 1025. Mathilda who married William the Conqueror. Please click on Baldwin V for the continuation of this line. Henry married on January 29, 1044 to Princess Anne of Kiev. For her descent from the early Viking chieftains in Russia, click on Princes of Kiev. Robert, the first of the Burgundian Capets, married firstly to Irmegard of Anjou who d.s.p. and secondly circa 1033 to Hélie, a daughter of Dalmas (I), Seigneur de Sémus (Semur-en-Auxois) and his wife Aremburge. There appears to have been some friction in this family. Robert divorced Hélie on January 15, 1055 and he murdered her father, Dalmas (I), about the same time. It is unclear which came first, the divorce or the murder; but obviously Robert wasn't getting along very well with his wife and her family. Hildegarde who married Gui Geoffrey, called William (VI), Count of Poitou. Died on October 18, 1102 at Tarsus. Hugh was Duke of France and Burgundy, Marquis of Orléans, Count of Amiens, Chaumone, Paris, Valois and Vermandois. He was a leader of the First Crusade, and died at Tarsus which is on the Mediterranean Sea about 250 miles south east of Ankara, Turkey. 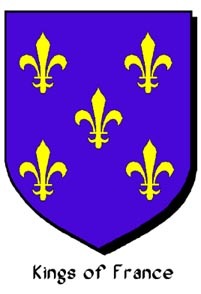 Hugh married to Adelaide of Vermandois daughter of Herbert (IV), Count of Vermandois and a descendant of Charlemagne. Please click Charlemagne for details. Isabel, also known as Elizabeth of Vermandois, married in 1096 to Robert de Beaumont, Count of Meulan. Isabel and Robert had children named Waleran and Robert which tend to be confusing because they were twins both born, of course, in 1104. Both married ladies names "de Montfort" and both had sons named Sir Robert de Beaumont. One begins to wonder if perhaps Robert and Waleran were the same person, but there are differences as shown next. Sir Robert de Beaumont (died in 1207), Count of Meulan. Margaret de Beaumont married Saher de Quincy. Hugh de Beaumont, said to have been created Earl of Bedford. Adeline who married Hugh IV, Seigneur of Montfort-sur-Risle. Aubrée who married Hugh II, Seigneur of Chateauneuf-en-Thimerais. Maud who married William Louvel, Seigneur of Ivri and Brevel. Isabel (or Elizabeth) de Beaumont who first "had an affair" with King Henry I of England and later married Gilbert FitzGilbert de Clare. William de Warenne, 3rd Earl of Warren & Surrey, born in 1119; whose daughter married Hamlin Plantagenet. Click on Hamlin Plantagenet for this line. Adelaide de Warren who is also known as Ada de Warren. Adelaide married in 1139 to Henry, Earl of Huntingdon who was the son of David (I) "the Saint", King of Scotland and Matilda of Nothumberland. Henry was next in line as King of Scotland, but he died about a year before his father. When David (I) died in 1153, he was succeeded Henry's son, Malcolm (IV). Please click on Earl of Huntingdon for the continuation of this line.